Burgundy rests on the blocks following her haulout and awaits fresh bottom paint. When Arv and I moved our boat west from the Chesapeake Bay we had no idea how different hull maintenance and care was in Southern California, where warm temperatures encourage bottom growth, diminishing hull speed and fuel efficiency. Like fellow boat owners at our Maryland marina, every spring we had our boat hauled and its bottom powerwashed and painted and its sacrificial zincs replaced. In San Diego, with its year-round temperate climate and electrolysis rampant in its boat-dense urban harbor, we quickly learned we’d need to have a diver regularly remove the plant and animal growth buildup and replace zincs more frequently. We were fortunate new friends on our dock recommended a well-established diving company, Aquarius Yacht Maintenance, whose gentle cleaning techniques, using “scrubbies” rather than scrapers, impressed us. At the San Diego Port District’s recent Clean and Green Boating Expo I ran into Aquarius’ CEO, Bill Rocco, also the long-serving president of the California Professional Divers Association (CPDA) and I asked him to share a few tips on how to choose a competent diver. Rocco’s first recommendation mirrored our experience — ask fellow boat owners whom they’ve used and liked. He suggested also asking marina staff, as they know which divers to avoid because of poor environmental or business practices. If you’re based in San Diego Bay make sure any diver you’re using has a current Port permit, Rocco urged. The Port District, as part of their anti-pollution and copper reduction efforts, now requires all hull-cleaning businesses to obtain permits and comply with best management practices under their in-water hull-cleaning regulations. A diving firm’s membership in CPDA, Rocco explained, signifies divers are trained in and comply with all relevant state and local environmental regulations. Throughout SoCal most boat bottoms kept in water full-time need to be cleaned about 15 times a year, every three weeks in summer and monthly in winter, allowing release of growth-inhibiting biocides in most bottom paints. “Frequent hull cleaning prolongs the life of the bottom paint,” Rocco said. High quality bottom paint with multiple coats should last about three years. 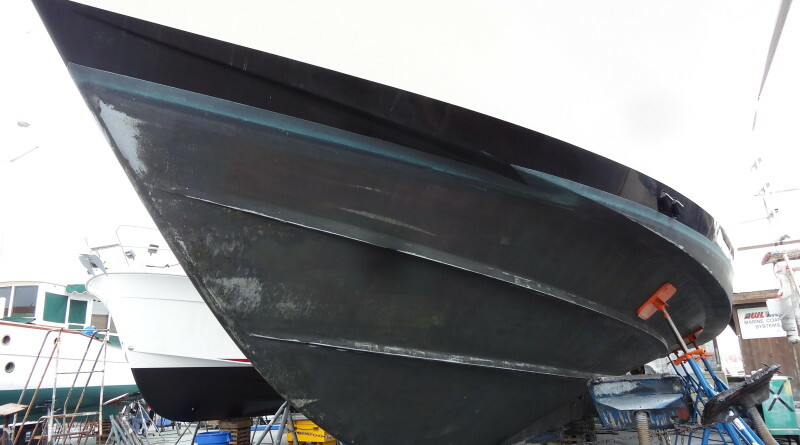 With our hull’s gentle cleaning, our bottom paint has lasted over four years between haulouts. Rocco explained there are two main types of effective hand cleaning: Employing scrubbies or a powered fine rotary brush. The effectiveness of each depends upon the diver’s training and skill. “You want to make sure the diving company has an (in-house) quality control officer who inspects the bottoms from time-to-time,” he said. Divers also oversee replacement of the sacrificial zincs, which are applied to underwater metal components to protect against electrolysis-induced corrosion. Zincs are changed when about half disintegrated. “An experienced diver will notice also if there’s a bonding issue and active corrosion. He can usually suggest remedies to the boat owner to correct the problem,” Rocco added. Rocco’s divers use three different types of scrubbies depending on the age and condition of the bottom paint. They start with a soft scrubby on new bottom paint before moving onto successively tougher scrubbies in later years. Aquarius divers receive initial training of about four to six weeks, followed by a two-year apprenticeship with additional training before becoming fully qualified. Sustained experience is what’s most critical, he emphasized. And what should a qualified diving company charge, per visit? Between $1.25 and $2 a foot for regularly scheduled cleaning, Rocco said. With conscientious care you can reduce avoidable maintenance costs.